Warsaw’s Lindsay Baker (left) and Nikki Grose encourage each other during regional play at Valparaiso Saturday afternoon. 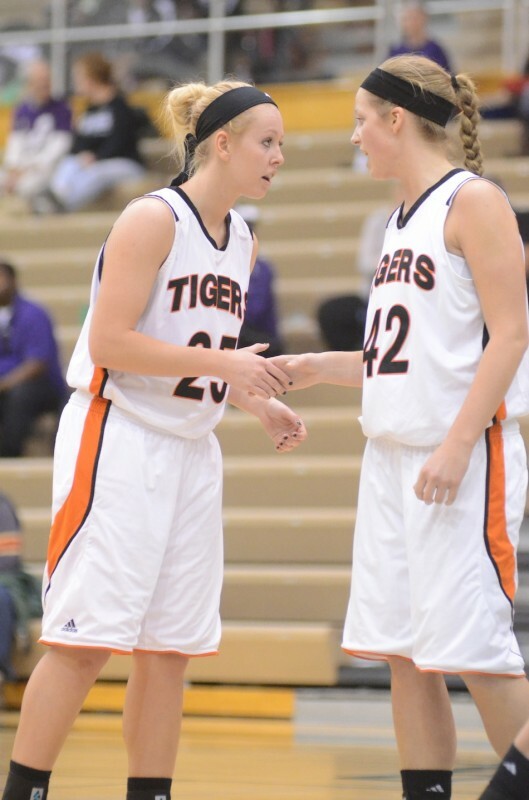 The pair helped the Tigers beat Penn 49-42 in a semifinal game. VALPARAISO – Nikki Grose was one very motivated young lady Saturday afternoon. That made it one very long day for the Penn girls basketball team. The Warsaw standout turned in a career-best performance at the best possible time to lead her team past Penn 49-42 in a semifinal game of the Class 4-A Valparaiso Regional. Grose poured in a career-high 22 points and grabbed a game-high 12 rebounds as the No. 8 Tigers earned the right to play for a regional championship Saturday night. Warsaw (23-1) advances to play No. 5 Merrillville (23-1) at 8:30 p.m. ET Saturday for a regional title and a spot in the semi state at either Warsaw or Crown Point on Feb. 23. Merrillville defeated Duneland Athletic Conference foe Lake Central 74-56 in the first semifinal game Saturday. Grose, a 6-1 junior center, finished 9-10 from the field in her outstanding effort. Senior Jennifer Walker-Crawford scored 10 points and had nine rebounds for the Tigers. Warsaw, playing in the regional for the first time since 2004, beat Penn for the second time this season. The Tigers won 55-42 at Penn on Jan. 16. Jennifer Walker-Crawford of Warsaw battles for a loose ball versus Penn Saturday. The senior star had 10 points in Warsaw’s 49-42 regional semifinal victory. Warsaw is now 7-1 all-time versus the Kingsmen, who had won two straight regional titles. Penn, which was state runner-up in 2011, finishes at 19-5. Junior Caroline Buhr paced Penn Saturday with 18 points and nine rebounds. The 6-1 Buhr did not play the first time versus Warsaw as she was still sidelined due to an offseason knee injury. Give an assist, according to Grose, to the doubters who discounted the Tigers. “I think people underestimated us,” said Grose. “You look at John Harrell’s blog and people were talking about Penn and Merrillville. It motivated us even more today. I know it did me. I look at that site before every game. The fired up Grose, appropriately enough, scored her team’s final six points of the win. It was the same old, same old as far as the formula for another win for Warsaw on Saturday. The Tigers combined a dandy defensive effort with another big third-quarter effort to spell success. Warsaw forced Penn into a 15-of-50 shooting performance, including an 0-of-11 from 3-point range. The Kingsmen, who shot just 14-of-48 (2-of-14 on threes) in the first loss to Warsaw, came into Saturday’s game with 117 treys on the season. Warsaw’s bread and butter 2-3 zone, featuring plenty of size with six-footer Lindsay Baker and the 6-1 pair of Walker-Crawford and Grose, tormented Penn’s streaky shooters. Penn’s top two scorers, seniors Olivia Carlton and Taylor Lutz, shot a combined 1-of-14 from the field (including 0-of-7 on threes). The outstanding duo, who were each averaging 11 points-per-game, totaled just nine points. Warsaw standout Nikki Grose and Camryn Buhr of Penn look to rebound Saturday. Grose had a stellar showing with 22 points and 12 rebounds in Warsaw’s win. “Nikki has been tremendous for us all year,” said Warsaw coach Michelle Harter. “When she decides no one is going to stop her, no one does. She did a tremendous job today on the boards and stepped up and hit key free throws. The great thing is that she was under control and focused on doing what we needed her to. “The big key was that we shut down their 3-point shooters. We frustrated them and didn’t let them get on a roll. We said we would rather give up a two than a three today. The threes really fire up a team like Penn when they start hitting them. Harter, who said she pays no attention to what is posted on media sites, didn’t mind however that her team was a little more motivated thanks to the outside noise. Penn led 13-10 after the first quarter Saturday as Lutz scored five points. The Tigers opened the second stanza with a 7-0 run, capped by a 3-pointer from Eryn Leek, to lead 17-13. Penn led 20-19 at halftime as both teams struggled shooting in the first 16 minutes. The Kingsmen were just 7-of-25 and Warsaw just 6-of-17 at halftime. Senior Melanie Holladay directs the Warsaw offense during regional play Saturday. The Tigers, as they have all season, came out on fire in the third period. A rebound basket by Walker-Crawford gave Warsaw the lead for good at 23-22 with 5:16 to play in the third quarter. 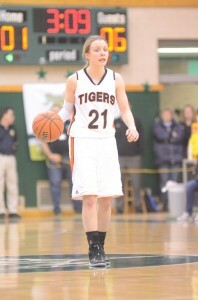 The Tigers, with Walker-Crawford scoring six points, outscored the Kingsmen 14-7 in the pivotal period to lead 33-27. It was simply too much Grose in the final frame for the Kingsmen to overcome. Warsaw led 37-27 on a layup by Grose with 7:00 to play. Penn answered with an 8-0 run to slice the lead to 37-35 on a pair of free throws by Jessica Alexander with 4:25 remaining. Warsaw countered with an 8-1 run to take control at 45-36 on a Grose bucket with 2:28 to play. Grose scored 12 of her team’s 16 points in the final period. Warsaw out rebounded smaller Penn 34-22 and shot a blistering 71 percent (10-of-14) from the field in the second half. The Tigers finished 16-of-31 from the field for 51 percent and 16-of-22 from the free throw line, which was more than enough to overcame a 16-turnover game. Leek scored six points and Melanie Holladay had five points and five rebounds for Warsaw. Baker had four points, four rebounds and four assists before fouling out late in the game. Brooklyn Harrison had two points and three assists for the winners. Penn, whose only regular-season loss last year was a 52-50 final at Warsaw, graduates four seniors in Carlton, Lutz, Jennifer Mater and Kathryn Knutson. Carlton plans to play collegiately at Coastal Carolina, while Lutz is headed to play hoops at Grand Valley State University. 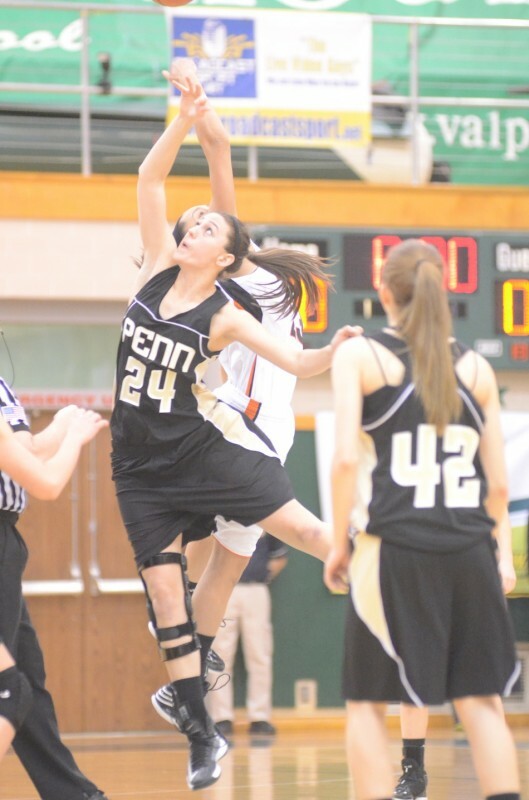 Penn’s Caroline Buhr goes up against Jennifer Walker-Crawford for the opening tip-off Saturday at Valparaiso.